The First Book for Pianists - Book/CD by Scott Price. By Wolfgang Amadeus Mozart (1756-1791). Edited by Willard A. Palmer. For solo piano. Graded Standard Repertoire; Masterworks; Piano Collection. Alfred Masterworks Editions. Classical Period. SMP Level 3 (Early Intermediate). Collection and performance CD. Standard notation, fingerings and performance notes (does not include words to the songs). 24 pages. Published by Alfred Music (AP.20852).ISBN 0739022369. With standard notation, fingerings and performance notes (does not include words to the songs). Classical Period. 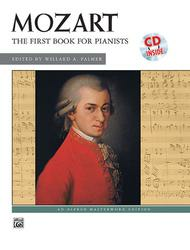 9x12 inches.This useful series, edited by Willard A. Palmer and others, features the easiest works of Mozart. All selections are presented in their original, un-simplified form and are organized in progressive order of difficulty. It allows students to begin playing this music from authoritative editions at an early stage in their studies. Pianist Scott Price has beautifully recorded all the pieces in the book, included on CD.About SMP Level 3 (Early Intermediate)Independent movement of the left hand. Multiple chords in a measure, and the introduction of triplets.